What Else Can I Expect From an Online Master's in Health Informatics Program? Health informatics is one of the most rapidly growing career pathways in the country. As the software and platforms used in informatics continue to evolve, qualified professionals who can adapt to the latest technologies are highly valued in the job market. An online master's degree in health informatics can help you further distinguish yourself from other job candidates and advance in your career at a speedier rate. More than 56,000 new jobs in medical and health services management are estimated to be created through 2024. WHAT CAN I DO WITH A MASTER'S IN HEALTH INFORMATICS DEGREE? Graduates with a master's in health informatics are prepared for careers as EHR implementation specialists, clinical informatics coordinators, and information security managers, among others. Read more here..
Health informatics is the term that's used to describe the acquisition, storage, retrieval, and use of health care information by health care providers. Students learn how to use the latest technology to make all health care information tasks more efficient. Read more here..
WHAT IS THE MOST COMMON DEGREE PURSUED IN HEALTH INFORMATICS? Many students pursue a bachelor's in health informatics, but a master's can prepare you for more advanced positions, such as information security manager. Read more here..
WHAT DEGREE DO YOU NEED FOR HEALTH INFORMATICS? A bachelor's in health informatics is usually required to obtain an entry-level position. A master's degree prepares students for more advanced positions in leadership. Read more here..
To become a health informatics specialist, professionals usually need to obtain at least a bachelor's degree in health informatics or a computer science related field. Professionals must also have knowledge of health care software systems. Read more here.. The best master's in health informatics degree programs equip you with a wide range of tech-related skills and extensive knowledge of the healthcare industry. Many programs culminate in a master's thesis or capstone project, allowing you to demonstrate everything you have learned over the course of your studies. Others require an internship or practicum course, where you will receive supervised hands-on training from industry experts. Learn more about what you can do with a master's in health informatics and what kind of career opportunities you can look forward to with this comprehensive guide. Health informatics is an interdisciplinary field that combines technology and healthcare; informatics refers to the process of obtaining, categorizing, and storing medical records and data. Health informatics has improved the healthcare industry by providing greater access to/management of patients' medical records and other important information. WILL AN ONLINE MASTER'S IN HEALTH INFORMATICS PROGRAM PROVIDE ME WITH THE SKILLS I NEED TO ADVANCE MY CAREER? Students who enroll in health informatics master's programs will spend roughly two years learning about the latest trends and developments in healthcare information technology. Courses cover the various ways that physicians and healthcare providers manage existing medical records, and how emerging technology can reshape healthcare delivery in the years to come. Internships also prepare you for the workforce through practical training. WILL AN ONLINE MASTER'S IN HEALTH INFORMATICS WORK WITH MY SCHEDULE? Online master's in health informatics programs are a flexible education option that cater to students who must balance their schoolwork with other commitments, such as employment or childcare. The online platform allows you to access course materials, submit written assignments, take exams, and communicate with their professors at your own convenience. Current technology also allows you to complete coursework away from your personal computer using a laptop, tablet, smartphone, or other device with Wi-Fi capabilities. Students can usually work with school officials to arrange internships that are close to home, as well. WHAT JOBS CAN I GET WITH MY MASTER'S IN HEALTH INFORMATICS? Students who earn a master's in health informatics online leave school prepared to enter the workforce in most entry-level roles, as well as some managerial positions normally reserved for applicants with an advanced degree. A bachelor's degree is considered the minimum requirement for many health informatics careers, leaving master's-holders well-positioned in the job market. However, it's important to note that certification is often required for employees in this field. According to the Bureau of Labor Statistics (BLS), commonly accepted certification credentials include the Registered Health Information Technician (RHIT) and Certified Tumor Registrar (CTR) credentials. WHAT ARE THE BEST ONLINE MASTER'S IN HEALTH INFORMATICS PROGRAMS? Choosing a program is an incredibly personal decision, and only you can properly evaluate whether a target school's strengths match your educational needs. The following ranked list of schools should serve as a helpful starting point in your search for the best masters in health informatics programs in the United States. If you are considering an online master's in health informatics, be sure to contact admissions specialists at different colleges and universities to learn more their about specific requirements and offerings. Stanford began offering a medical information degree in 1982 that evolved into the biomedical informatics degree at the Stanford Medical School. To help broaden the program's reach and provide access to working professionals, the Stanford Center for Professional Development introduced the professional MS in biomedical informatics. In this distance education MS degree, students learn to analyze biomedical data in a variety of contexts, including general bioinformatics, public health, and clinical informatics. Stanford delivers much of the 45-credit program online through a blend of asynchronous and synchronous study. While students can access most of the courses online, some may require campus visits. Students in the program complete 17 credits in core biomedical informatics courses. Additionally, they take 18 credits in courses related to computer science and mathematics, along with four credits dealing with social and ethical issues in the field. Each course builds on foundational learning from undergraduate degrees and professional experience. Students also complete six credits in electives. To graduate from this part-time online master's in health informatics, the typical student takes 3-5 years. Stanford allows learners to sign up for a maximum of three courses per quarter. For admission into the program, applicants must maintain employment in the biomedical informatics field or a related industry. Since many of the classes require foundational knowledge and training, applicants must also have completed prerequisites in calculus, biology, statistics, computer science, and algebra. Due to residency requirements, Stanford does not issue transfer credits into this program. Stanford receives regional accreditation from the Western Association of Schools and Colleges. As one of Northwestern's 12 colleges and a central part of the institution for more than 80 years, the School of Professional Studies (SPS) continues to provide working professionals with access to higher education. Now with more than 13 master's degrees available during the evening or online, Northwestern and SPS provide students with alternatives to on-campus program delivery. Online programs combine asynchronous and synchronous study, though most classes occur outside of traditional work hours. Designed by Northwestern's school of medicine, the online MS in health informatics (MHI) teaches students to use health data to improve public health and patient care. Students learn to assess and evaluate healthcare informatics of various types, including financial, clinical, and technical. The MHI program allows learners to specialize in one of three areas: health administration, clinical informatics, or health technology informatics. In this 12-course MHI program, students complete five core courses, which include informatics fundamentals, healthcare foundations, ethics, and leadership courses. Each learner also chooses between a thesis or a capstone project. The online master of science in health informatics then requires every student to choose a specialization and complete four required courses within it -- plus three elective courses. The program also prepares students taking the clinical informatics track for medical informatics certifications. Each applicant must hold a bachelor's degree for admission. While Northwestern does not require healthcare or IT degrees, the school does prefer applicants with relevant experience. Experienced applicants may even receive transfer credit for IT and clinical practice courses. The typical student completes the degree in 2-3 years. Northwestern receives regional accreditation from the Higher Learning Commission. Northeastern strives to innovate and increase access to education for working professionals all over the world. By creating online programs and establishing the Global Network, a set of regional campuses and hubs all around North America, Northeastern opens its programs to students who otherwise could not access them. With more than 60 online and hybrid programs, Northeastern removes many barriers of entry for its students. Hosted by the faculty from the health sciences and computer sciences schools, the interdisciplinary online MS in health informatics combines healthcare administration with computer and information sciences. The program prepares students to navigate the healthcare industry as it evolves into a more technologically advanced system. Graduates can implement and utilize advanced technologies as managers and leaders within the industry. The 33-credit degree typically takes students 2-3 years to complete. Of the 11 required classes, three come from core courses in healthcare, health informatics, and a research capstone project. Students also complete a combined six courses from business management, technical, and health informatics fields -- plus two elective courses. In keeping with Northeastern's tradition of experiential learning, students may take co-ops or summer internships, as well. For admission into the online health informatics master's degree, each applicant must possess a bachelor's degree and a 3.0 GPA. Northeastern also requires every student to earn a 3.0 GPA to graduate from the program. For transfer students, the school offers an advanced standing version of the program. Northeastern receives regional accreditation from the New England Association of Schools and Colleges. As the first public university in the country, UNC-Chapel Hill boasts a long history and established set of traditions. The school also pushes for innovation in its programs, particularly in its delivery methods. Several of UNC-Chapel Hill's schools now offer programs online. In total, the university offers 19 online degrees and certificates, including nine master's degrees. In the biomedical and health informatics (BMHI) program, students learn to manage and analyze health data for research, public health, and clinical systems. They gain the skills to use health information systems to improve the quality of healthcare overall. The BMHI program offers two tracks: clinical informatics and public health informatics. The clinical informatics track prepares graduates for board certification. Depending on their course load, students typically complete the 35-credit degree in 1-3 years. While a full course load may allow completion in less than one year, students may find some courses unavailable online. The typical full-time student, therefore, completes the degree in 16 months. The online master's in health informatics consists of core courses in informatics, professional skills, and biomedical foundations -- plus a course in one of the specializations. At the end of the program, each student completes a capstone internship and project. For admission into the program, each applicant needs a bachelor's degree and a 3.0 GPA. While UNC-Chapel Hill does not make prior experience mandatory, it prefers applicants with research and relevant work experience. Students with prior learning may receive up to seven transfer credits to put toward the degree. UNC-Chapel Hill receives regional accreditation from the Southern Association of Colleges and Schools. At UW, students gain access to one of the largest research centers, more than 300 individual programs, and a sprawling, scenic campus in Seattle. Ranked 10th in the U.S. News & World Report's listing of the best global universities, UW attracts students from all over the world. With its online programs, working professionals can also study while maintaining employment. The master of health informatics and health information management (MHIHIM) provides students with leadership skills and the expertise to manage information systems in various healthcare settings. The program includes five major areas: health information systems, information governance, data analytics, leadership, and information privacy and security. Each student concludes the degree with a capstone project that allows them to integrate their learning into a clinical setting. Students can complete the MHIHIM program within 18 months by taking three courses each quarter. The 54 required credits progress from introductory courses in terminology and foundations into advanced technology and specialized healthcare courses. UW delivers most courses asynchronously online. However, the online health informatics master's degree includes weekly scheduled webinars, along with a mandatory on-campus session once per month. For successful admission, each applicant should possess a bachelor's degree and a 3.0 GPA. UW prefers students with degrees in business, healthcare, or information technology, but relevant work experience and a bachelor's degree in another field may qualify. UW receives regional accreditation from the Northwest Commission on Colleges and Universities, and the MHIHIM program receives accreditation from the Commission on Accreditation for Health Informatics and Information Management Education. Educating more than 50,000 students worldwide, USF offers varied program offerings and delivery methods. According to U.S. News & World Report rankings, USF provides some of the best educational opportunities for working students in the country. As a major contributor to the school's online programs, USF represents the only medical school offering a fully online MS in health informatics. This 32-credit online master of science in health informatics provides students with the knowledge and skills needed to manage data and information in healthcare. As the healthcare industry evolves to improve and optimize patient care, it requires trained professionals to manage and make effective use of cutting-edge technology. Students complete 11 courses in this degree, including four core classes, five required courses, and two electives. The core courses introduce students to health records, data management, health informatics, and information systems. The required classes delve into law, ethics, business models, communication, and management. For the electives, students may choose among complementary courses, an internship, and an independent study. USF delivers online programs asynchronously, with each course running for eight weeks. A successful applicant holds a bachelor's degree in science, computer science, information science, or a related field. In addition to a 3.0 overall GPA, each applicant must earn a 3.0 GPA in the sciences. USF receives regional accreditation from the Commission on Colleges of the Southern Association of Colleges and Schools, while the Healthcare Information and Management Systems Society recognizes USF Health as an Approved Education Partner. Located outside Boston in Waltham, Massachusetts, Brandeis offers some of the nation's most reputable programs. Consistently ranked among the top 35 national universities by U.S. News & World Report, Brandeis also offers a variety of online programs. For more than 10 years, the institution's online program offerings allowed students from around the globe to study at Brandeis. The Graduate Professional Studies department expanded that reach to accommodate working professionals, as well. Launched in 2010, the MS in health and medical informatics teaches students both to use and manage information within the healthcare system and to understand the laws and regulations surrounding the data. Graduates design and implement policies and IT solutions to improve patient care. The entire online master's in health informatics consists of 10 courses for a total of 30 credits that students can complete on a part-time basis. Six required classes include information systems, health records, data analysis, security, business issues, and legal issues. The four electives allow students to take advanced and specialized courses. At Brandeis, online students join small classes which hold a maximum of 20 students. For admission, each applicant should boast a bachelor's degree and a strong academic history. Though the program accepts students with any bachelor's degrees, Brandeis prefers those with degrees in healthcare, IT, or computer science. Furthermore, relevant work experience may grant applicants a competitive advantage. Once enrolled, online students gain access to student, academic, and enrollment advisers. Brandeis receives regional accreditation from the New England Association of Schools and Colleges. With its main campus in Orlando and more than 12 locations surrounding the city, UCF offers students in central Florida plenty of study opportunities. The online programs available through UCF Online provide residents throughout the rest of the state and country with equal opportunity. Ranked 10th on the list of most innovative schools by U.S. News & World Report, UCF strives to reimagine and reinvent program delivery and online education. The online MS in healthcare informatics, one of more than 25 online master's degrees available at UCF, prepares students to work within the evolving world of healthcare information. Students learn to utilize emerging technologies to improve healthcare data, delivery, and patient care. Furthermore, graduates gain the skills to lead within a healthcare setting, getting the most out of the technology and the staff. 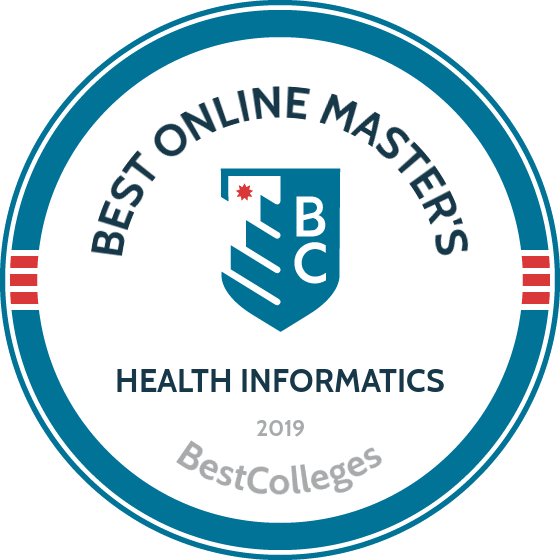 Designed as a cohort program, the 38-credit online master's in health informatics requires students to complete courses in a particular order. The 10 required courses build on each other, beginning with fundamentals courses in informatics and ending with an internship. The program also includes a capstone project. Admitted students without healthcare informatics, administration, and terminology experience may need to complete additional courses in the program. UCF admits students for the fall and spring semesters, and successful applicants hold a bachelor's degree from an accredited school. Though the program features few mandatory requirements, applicants with relevant experience receive preferred status. Graduates with eligible work experience may also earn the certified health data analyst certification. Online tuition remains the same for out-of-state and local students. While the school offers the MS in healthcare informatics online, some electives may require campus visits. UCF receives regional accreditation from the Southern Association of Colleges and Schools. Set in Washington, D.C., GW students surround themselves with some of the nation's most important institutions and policymakers. As the only school of public health in the region, GW programs and students benefit from valuable partnerships, immersion, and exposure. With the introduction of online programs, GW allows students from outside the state to attend classes without relocating. The online MS in management of health informatics and analytics teaches students to use tools like predictive analytics and machine learning to inform clinical care and research. Graduates help integrate new technologies and policies to improve clinical and business operations. Students typically complete the 45-credit degree in under two years, but GW allows up to four years for completion. The online master of science in health informatics consists of eight modules that each run for 10 weeks. In addition to analytics and informatics, some of the modules include business intelligence, health innovation, and health law. Students participate in two campus visits during the program. These immersion experiences at the GW campus provide credit for leadership and health information simulation training. The program then concludes with a capstone project. GW's online program offers four start dates throughout the year and features live, scheduled class sessions and meetings. For admission, each applicant must possess a bachelor's degree with a 3.0 GPA, plus two years of experience in a healthcare profession. Applicants may also possess three years of experience in another field, permitted they complete an online exam. GW receives regional accreditation from the Middle States Commission on Higher Education, while the Healthcare Information and Management Systems Society recognizes the program as an Approved Education Partner. Accessible education constitutes one of Boston University's founding principles. With 16 degree-granting colleges and schools, in addition to an online education division offering degrees delivered asynchronously, BU meets its lofty goals. The institution's online education department, established in 2002, provides students with access to the university's best programs, including its information assurance programs -- for which the National Security Agency and the Department of Homeland Security recognize BU as a Center of Academic Excellence. In the online MS in computer information systems with a concentration in health informatics, students gain the skills to collect and store information safely and securely. In addition to learning about the medical world's electronic record systems, students gain exposure to emerging medical and biomedical technologies. The 40-credit degree typically takes students 18-24 months to complete, depending on course load. Within the health informatics concentration, students complete 10 courses. The five core classes delve into health informatics, health records, and cybersecurity by focusing on programming, databases, and IT strategy and design. Upon completion of the online master's in health informatics, graduates may qualify for registered health information administrator and registered health information technician certification. Each applicant must hold a bachelor's degree from an accredited institution. While BU admits students from many disciplines, students without prior learning in information systems may need to complete prerequisite courses. BU receives regional accreditation from the New England Association of Schools and Colleges, while the Commission on Accreditation for Health Informatics and Information Management Education provides accreditation for the online program. As one of U.S. News & World Report's top 100 universities, programs at DU are in high demand for students at every level. University College, one of the university's 10 degree-granting colleges, offers online degrees for students around the world, particularly working professionals. With more than 1,500 graduate students and 13 master's degrees available online, the online college also represents the largest graduate school in DU. In the online MS in healthcare management, students learn to use informatics tools to develop and implement plans and projects to solve healthcare problems. The program prepares graduates to lead and manage the integration and optimization of technology within a healthcare setting. The typical student completes this degree within 18 months, working through 10-week class sessions online. The 48-credit degree consists of 12 classes: five core, six concentration, and one elective. The core courses focus on healthcare regulations, finance, and communication, along with a capstone project to provide practical experience. Within the concentration courses, students learn about healthcare databases, programming, project management, and biostatistics. While the ideal elective course comes from within the healthcare management program, students may choose interdisciplinary classes with approval. At DU, students benefit from asynchronous course delivery. For admission into the online master's in health informatics, each applicant must possess a bachelor's degree and a 2.5 GPA. Students with relevant graduate education may receive up to 12 transfer credits. DU receives regional accreditation from the Higher Learning Commission. Located in Minneapolis, Minnesota's largest city, the University of Minnesota-Twin Cities offers a master of health informatics. Students may take the online master's in health informatics on a part-time or full-time basis, providing flexibility to busy professionals. Learners take a year or more to complete the 31 credits of coursework. Students may take courses entirely or partially online. Learners enrolled in the master's in health informatics online programs come from a variety of professional backgrounds. They each have the same goal of using technology to solve healthcare issues. The curriculum includes core courses in health informatics and electives in health sciences and technical areas. Coursework for the health informatics master's degree online includes foundations of health informatics, consumer health informatics, and biostatistics. Students must maintain a minimum 2.8 GPA while in the master's program. Learners complete a capstone project examining an issue in health informatics. To apply, the university requires a bachelor's degree with a minimum 3.0 GPA and minimum test scores on the GRE. The application process requires candidates to submit transcripts and recommendation letters. Students must show experience working with computer programming languages and meet course prerequisite requirements. International students must present TOEFL, IELTS, and MELAB scores to demonstrate English proficiency. The University of Minnesota-Twin Cities holds accreditation from the Higher Learning Commission. The University of San Diego, a private Roman Catholic research institution, offers a master of science in health care informatics. The 37-credit online program takes 24 months to compete, though the university also offers a more traditional on-campus option. The online master's in healthcare informatics program targets professionals in the medical and technology field. Doctors, nurses, and professionals in the computer technology industry make excellent program candidates. The need for healthcare and technology experience leaves a skills gap the University of San Diego seeks to fill. Coursework includes health systems strategic planning and management, systems analysis and design for healthcare informatics, and a new program called clinical analytics and decision support. Students leave with skills in financial management, database design, and strategic planning. They attain skills in ethical and legal healthcare decision making, leadership and communication, and knowledge integration. Program applicants must hold a bachelor's degree and a minimum 3.0 GPA. Students must demonstrate technical experience and an understanding of basic medical terminology. Professionals without a healthcare background must complete an online medical terminology course by the second semester. The online master's in health informatics program prefers candidates with at least one year of work experience. International students must demonstrate proficiency in English to qualify for the master's in science in health informatics online. During their online master's in health informatics studies, learners create a portfolio that shows their expertise and complete a capstone project at the end of the course. The University of San Diego holds accreditation from the Western Association of Schools and Colleges. Founded in 1801 in the capital city of Columbia, the University of South Carolina-Columbia offers a master of health information technology online. Students complete the 36-credit course in 18-24 months, depending on whether they attend school part time or full time. The health informatics master's degree online offers training in using technology to transform healthcare systems, tools and technologies to improve healthcare, and health information systems management. Coursework focuses on the increasingly interdisciplinary nature of healthcare and technology with a heavy information technology concentration. Students take courses in health information systems management, health database systems, and health economics. Online courses do not require students to come to campus. Learners take courses in accelerated eight-week sessions, shortening the time to graduation. The college of engineering and computing offers the university's online master's in health informatics. Learners complete a 250-hour IT internship or practicum. From this practicum, students produce a final paper. To apply, students need a minimum 3.0 GPA and must provide GRE or GMAT scores. The university waives the GRE requirement for candidates with three or more years of work experience and advanced education credentials. Candidates must submit two recommendation letters and a career goal statement. The University of South Carolina-Columbia holds accreditation from the Southern Association of Colleges and Schools Commission on Colleges. The university's online master's in health informatics holds accreditation from the Commission on Accreditation for Health Informatics and Information Management Education. Mississippi College holds the distinction of being the state's oldest private institution. The school opened its doors the same year America celebrated its 50th birthday and John Quincy Adams served as president. Founded in 1826 on a small plot of land in central Mississippi, the Christian university focuses on liberal arts, sciences, and professional studies. As part of its mission, Mississippi College offers a master of science in health informatics. Students take 30 credits online. Courses include research methods and procedures, e-medicine business models, and the legal aspects of healthcare administration. Learners study how behavior and relationships impact efficiency and morale, develop a research proposal or perform research meta-analysis, and study database management and technologies. Students perform a 150-hour, onsite internship as part of their online master's in health informatics. The online master's in health informatics prepares graduates for careers as medical coders, cancer registrars, or health information technicians. Students must have a bachelor's degree in a healthcare science field such as nursing, computer science, and healthcare administration. Candidates must maintain a minimum 2.7 GPA, an understanding of information systems theory and design, and at least two years working in a healthcare or information management setting. Students must also meet minimum GRE score requirements. The master of science in health informatics online requires learners to take 18 credits in core courses and 12 hours in health services administration. Mississippi College holds accreditation from the Southern Association of Colleges and Schools Commission on Colleges. Though its history only dates back 60 years, George Mason University is now the largest public research university in Virginia. The school serves over 34,000 students at its four campuses in Virginia and study-campus in Songdo, Korea. GMU's residential flagship campus in Fairfax, Virginia houses ten schools and colleges across many disciplines. The school was the first university in the U.S. to offer doctoral degree programs in 21st-century fields such as conflict resolution, bioinformatics, computational social science, and information technology. The MS in health informatics prepares students for work with health data analytics and the design, evaluation, analysis, and use of health information systems. The MSHI integrates knowledge of healthcare, technology, data science, and artificial intelligence. The 33- to 39-credit program is available in three areas of focus: health data analytics (HDAN), health informatics management, and population health. The health data analytics concentration is offered completely online. The MSHI core covers an introduction to health informatics, healthcare databases, and advanced health information systems. With prior equivalent coursework, students may earn an exemption for two of the core courses: computational tools in health informatics and an introduction to the U.S. health system. For these students, program requirements reduce to 33 credits. For the HDAN track, learners explore topics like statistical process control, observational data, and data mining in healthcare. These classes cover concepts in classification, construction induction, cluster analysis, and prediction using decision trees, attributional rules, and Bayes network. Average completion time for this online degree in health informatics is two and a half years. To apply, candidates should hold a BA or BS from an accredited university or college. GMU prefers candidates with a minimum GPA of 3.25. Students can transfer up to 12 credits into the program from prior graduate coursework. A private research university situated in Coral Gables, Florida, the University of Miami prides itself as a major research institution. Founded in 1925, the university embarked on a research and innovation mission with an academic health focus. The mission applies to Miami's master of science in health informatics program, which prepares students for the transition to an electronic healthcare records system. Students typically take 22 months to complete the 33-credit curriculum. Learners take classes in information security, data analytics for health informatics, and the design, development, and clinical application of healthcare databases. The coursework covers information systems' interactions in healthcare and how change affects healthcare organizations and policies. Learners explore strategies and the importance of protecting data. University of Miami students gain access to a network of 170 professionals and 6,000 students for support in job placement and career advice. Students finish their master of science in health informatics online with a three-credit capstone project that applies classroom learning to real-world solutions. After graduation, students qualify for jobs as chief clinical information officers and directors of clinical informatics. Candidates in the master's in health informatics online program must submit an application with school transcripts, a resume, personal statement, and three recommendation letters. Students with experience in healthcare and information technology make ideal candidates. While the master's in health information online program takes place online, the university offers on-campus networking opportunities to foster interaction. University of Miami holds accreditation from the Commission on Colleges of the Southern Association of Colleges and Schools. Located in the country's third largest city, the University of Illinois at Chicago (UIC) has 15 colleges across the state. UIC, a leading research institution, strives to address the challenges facing cities while serving as the primary source for training professionals in the health sciences. To meet this goal, UIC offers a master of science in health informatics. UIC offers a concentration in health data science that provides more in-depth study of healthcare data. The university also makes available an online post-master's certificate in health informatics. The health informatics master's program online holds accreditation from the Commission on Accreditation for Health Informatics and Information Management Education. The online master's in health informatics requires students to complete 24-42 credits, depending on the chosen program. The three-year course of study prepares learners for jobs as a chief medical information officer, a clinical informatics director, or a chief information officer. The master's in health informatics online program aims to train students in the evolution of analytics and healthcare. Learners take classes in medical terminology for health information management, communication skills in health informatics, and mobile health informatics. Coursework examines social and organizational issues in health management, healthcare project management, and healthcare transformation using business intelligence and predictive analytics. Students accepted into the master's in health informatics online program must maintain a 3.0 GPA. All learners complete a capstone project. When applying, students must present college transcripts that show a minimum 3.0 GPA in their undergraduate work. UIC holds accreditation from the Higher Learning Commission. Florida International University (FIU) opened in 1972, built on an abandoned airfield in Miami, Florida. In the past four decades, Miami's only public research university has expanded to six locations and grown into one of the country's largest universities. FIU offers a master of science in health informatics and analytics. Students may complete the 32-credit program in as few as 14 months. Housed in the university's business school, the program attracts professionals in information systems and healthcare sectors.The university's online master's in health informatics holds accreditation by the Commission on Accreditation for Health Informatics and Information Management Education. Students take courses in healthcare project management, consumer health informatics, and information security and compliance. Coursework covers the role informatics play in the healthcare system, IT project management, and how to use outcomes data to assess the quality of care. During professional development programs, students may complete the Lean Six Sigma Yellow Belt Certification, which recognizes professionals well-versed in leading or working on improvement projects. When applying, candidates with a bachelor's degree, a minimum 3.0 GPA, and four years of relevant work experience don't need to submit standardized test scores. Candidates who do not meet the work requirements must meet minimum GRE or GMAT scores. Students with master's degrees may apply. The competitive program only accepts 40 students each year. The master of science in health informatics online strives to show how advanced information systems can create a more efficient healthcare system. FIU holds accreditation from the Southern Association of Colleges and Schools Commission on Colleges. Nova Southeastern University (NSU) opened its doors in Ft. Lauderdale, Florida, in 1964, starting as a graduate program in physical and social sciences. The institution took another step in 1972 when NSU offered its first off-campus course in education. NSU continues its distance education tradition with its master of science in biomedical informatics. The program prepares graduates for jobs as health information technology educators and trainers, chief nursing information officers, and programmers.These professionals work in hospitals, for insurance or pharmaceutical companies, in academia, and in community health centers. The online master's in health online focuses on computer science, clinical informatics, and the business and management of health information technologies. Students earn certifications from Lean Sigma Six Green Belt, Certified Professional in Healthcare Information and Management Systems, and NextGen. Students take 44 credits in the master's in health informatics online program. Classes cover database systems in healthcare, computational informatics, and systems analysis and design of healthcare. Learners study project management in information technology, biostatistics, and healthcare informatics systems' evaluation methods. Students must complete a hands-on practicum. Applicants must possess a health professions degree or show a background in biomedical sciences through work experience or credentials. Candidates must hold an undergraduate 3.0 GPA and submit GRE, SAT, or ACT scores. NSU holds the distinction of existing as one of the few universities to receive Carnegie's Community Engagement Classification award. The Southern Association of Colleges and Schools Commission on Colleges provides NSU's accreditation. Regis University, a Jesuit institution, overlooks the Rocky Mountains in the Mile High city of Denver. But Regis is more than just a beautiful location. The school formed in 1877 when a group of exiled Italian Jesuits created a school in Las Vegas and later moved it to Colorado. Now, Regis boasts five colleges and more than 10,000 students. The university also offers 80 online degree programs, including the master of science in healthcare informatics and information management. Online master's in health informatics graduates find careers as clinical informatics specialists or managers and nursing informatics directors. These graduates work for medical groups, healthcare technology firms, and in academia. Regis' Center for Career and Professional Development offers career support and advice. The master of science in health information online prepares graduates for roles in information technology that support the care of patients. Students take 36 credits over 24 months. Learners take 24 credits in core courses and another 12 credits in either information technology, healthcare services, or data science. Coursework covers the design and selection of IT systems in healthcare, managing a secure enterprise, and healthcare performance evaluation. Students use case studies and applied projects to understand how healthcare technology can improve patient care. To apply, students must submit a resume, two recommendation letters, an essay, and transcripts. Applicants need a minimum 3.0 GPA and a bachelor's degree. The best candidates come from a background in healthcare management or technology. Regis University holds accreditation from the Higher Learning Commission. With colleges across Minnesota, including its home base in Duluth, the College of St. Scholastica has educated students since 1912. The 186-acre Duluth campus, overlooking Lake Superior, adheres to Benedictine principles of stewardship, respect, community, hospitality, and a love of learning. This learning extends to the college's master of science in health informatics. Students take courses in health information security systems, advanced biostatistics and health analysis, and health information security systems. Learners gain a deeper understanding of IT project management, the role of informatics in the U.S. healthcare system, and information security system strategies. The master of science in health informatics online requires 42 credits with a two-year pathway to completion. St. Scholastica offers an online health informatics certificate that students can complete in three semesters. Students complete an applied research project and present the results during live virtual presentations. Students may choose to apply for certified health data analysts certification. Applicants for the online master's in health informatics must meet a minimum 3.0 GPA requirement and take a statistics course. They must present their bachelor's transcript, a 500-word essay, one reference, and a resume. The master's in science in health informatics online holds accreditation from the Commission on Accreditation for Health Informatics and Information Management Education. Graduates qualify for positions as an informatics researcher, director of data security, and data architect. St. Scholastica launched its first health information program in 1935, gaining a reputation for excellence in the field. St. Scholastica holds accreditation from the Higher Learning Commission. Started in 1851 by the Society of Jesus, Saint Joseph's University is just 15 miles from Philadelphia, Pennsylvania. A Jesuit university with a liberal arts focus, Saint Joseph's offers a master of science in health administration with a concentration in informatics. Students take 14 courses and 42 credits over 2-3 years. Learners take core courses in health administration, healthcare law, and healthcare informatics. The master of health informatics online program requires 12 credits of specialized coursework. Students gain a deeper understanding of the importance of internet technology in healthcare by examining market trends. Courses in the online master's in health informatics program review analysis and case studies in internet networks. Students must present a personal letter detailing their interest in the master of science on health informatics online. Applicants for the master's in health informatics online program must submit two recommendation letters and a summary of work experience. Candidates who graduated with an undergraduate GPA of less than 3.0 must provide a letter of explanation. Saint Joseph's prefers candidates with a background in health services. Students completing the online master's in health informatics find work as health informatics specialists, clinical informatics managers, and design support analysts. Insurance and pharmaceutical companies and health providers employ these professionals who find efficiencies in healthcare by using technology. Candidates learn to implement technology in a healthcare setting that helps lower costs and patient outcomes. Saint Joseph's holds accreditation from the Middle States Commission on Higher Education. When it opened in 1839, the University of Missouri (MU) was the first public university located west of the Mississippi. The Columbia-based university, the state's largest higher education institution, holds membership in the Association of American Universities. UM offers more than 90 online courses, including the master of science in executive health informatics. MU offers a hybrid learning experience through its executive program for working professionals. Students take courses on campus three weekends during the semester and supplement learning with online courses and independent study. Candidates need at least three years of work experience in the medical or information technology field. Physicians, nurses, and IT managers make excellent candidates for a master's in health informatics online program. MU also offers a dual degree in health informatics and health administration. Students take 33 credits over two years in the health informatics master's degree online program. Graduates of the program qualify for careers as chief information officers, systems developers, and software designers. During the application process, candidates must provide a letter of support from employers, a resume, a personal essay, and three recommendation letters. Given the work experience requirements, candidates do not submit GRE and GMAT scores. Learners in the online master's in health informatics program study the U.S. healthcare system, the enterprise information architecture, and decision support in healthcare systems. Students receive instruction in data warehousing, health data analytics, and information architecture. The University of Missouri maintains accreditation through the Higher Learning Commission. Carlos Fillmann grew up in Novo Hamburgo, Brazil, and earned his undergraduate degree in biology from the State University of New York-Oswego before deciding to pursue his two passions: healthcare and information technology. In 2018, he graduated with his master of science in health informatics from Logan University near St. Louis, where he learned to use technology to improve patient care and healthcare business practices. Carlos currently works as a telehealth technician with Finger Lakes Community Health in upstate New York, which provides care to the region's agricultural workers. Why did you choose to earn a master's in health informatics? How does the field represent an intersection of your two passions -- healthcare and information technology? I chose to earn a master's in health informatics because it allows me to utilize information technology to increase quality of care. I started my career in healthcare working with telehealth, and every day I get to use information technology to connect patients with providers they would normally not have access to. What was the job search like after completing your master's degree in health informatics? Did you feel fully prepared for the transition from school to the workplace? Upon completing my master's degree in health informatics, I felt very prepared to transition from school to the workplace. Logan University supported me every step of the way and did not stop once the degree was completed. What are some crucial skills that you acquired through your master's program? Through the master's program, I acquired leadership, project management, and healthcare systems skills that I now use daily. Work brings new challenges every day, and I always look forward to them. I work with patients who live in rural areas and do not have easy access to healthcare. One of the challenges I face every day is ensuring these patients have successful and effective telehealth appointments. Additionally, I am constantly looking for new and better ways to increase the quality of care and bridge gaps in care through telehealth. How have you seen the health informatics field change during your career? What changes do you anticipate for the field in the coming years? Telehealth is constantly evolving. Since I started working in the field, I have been involved in many different implementations, allowing me to apply what I learned at Logan University immediately. The advancements in technology, combined with the communities who still have limited access to healthcare, makes telehealth a field with great potential. What advice would you give to students who are considering a degree in health informatics? Technology plays a critical role in the delivery [of] quality patient care. If you enjoy technology and have a passion for helping people, consider a career path toward health informatics. The healthcare landscape is growing and evolving at a rapid pace; this field provides many opportunities for those who choose to be leaders in healthcare. Online health informatics programs can vary in terms of their focus and requirements. Programs with different concentrations prepare students to pursue different roles and therefore, coursework requirements will vary. Some programs emphasize hands-on learning and include internships and fieldwork, while others focus on healthcare theory and include comprehensive exams or thesis projects. These programs can also vary in terms of length, with many taking two to three years to complete. Health Technology Informatics This concentration focuses on technology instead of the healthcare management component of healthcare informatics. Students will learn about data analytics, information systems, and data management as they apply to healthcare management. IT consultant or specialist for health care software developers, web developers, hospitals, insurers, private practices, or suppliers; IT manager for healthcare firms; information system manager. Law, Ethics, and Society in Health Informatics: These courses cover the legal, social, and ethical issues related to health informatics and are a core component of most programs. Coursework often includes the examination of case studies and legal examinations. Students learn the legal requirements that are associated with handling sensitive patient data and how to make ethical decisions in analytics. Health Informatics Fundamental Concepts: Most online health informatics programs have a core requirement in the theoretical and practical concepts that are foundational to the field. These fundamental concepts typically covers the “how and why” of communication and information systems related to informatics. American Healthcare: The American healthcare system is complex and constantly changing due to the introduction of new laws. Online master's in health informatics students study the history of American healthcare, its modern day functions, and what to expect in the future. Healthcare Administration: Health informatics specialists and consultants have become an important part of the complicated world of healthcare management. Learning about healthcare administration helps informatics specialists learn more about the framework, problems, and organization of the entire system. HOW LONG DOES IT TAKE TO GET AN ONLINE MASTER'S IN HEALTH INFORMATICS? A master's in health informatics online can typically be completed in 18 to 36 months. The most significant factor that determines completion time is whether a student enrolls part-time or full-time or is in an accelerated or standard program. Credit requirements also impact enrollment time, with most programs requiring 36 total credits. When selecting a program, students should also pay close attention to internship, fellowship, or capstone requirements that may affect completion time. Certified Professional in Healthcare Information and Management Systems: The CPHIMS recognizes healthcare information professionals who hold a bachelor's degree and who pass the two-hour certification test. The certification is offered by the Healthcare Information and Management Systems Society. Advanced Health Informatics Certification: The AHIC is a newer certification from the American Medical Informatics Association. This certification is designed for informatics experts in the areas of public health, healthcare, and private health. To be eligible for certification, students must have a master's degree and 15 months of professional experience. College or university accreditation means that a school has been evaluated by an authoritative body in education and deemed to fit the criteria of an effective higher learning institution. Many U.S. schools are accredited by one of six regional accrediting agencies, such as the New England Association of Schools and Colleges. This organization is tasked with accrediting colleges and universities in the New England area. These regional agencies operate with recognition from the U.S. Department of Education and the Council for Higher Education Accreditation (CHEA), which is a nongovernmental gatekeeping organization that ensures quality in higher education. Schools can also receive national accreditation, an equally legitimate form of accreditation given by CHEA-approved organizations to many online, technical, or adult learning schools. Some programs are also accredited by relevant professional organizations, such as the American Medical Association. Selecting an accredited program is important because it means that your degree meets professional standards and will be respected by other institutions and employers. Before enrolling, be sure to check for your university's accreditation status. There are several reasons behind the recent boom in the health informatics industry. One is an increasing number of Americans seeking medical treatment; millions of previously uninsured adults and children now have health coverage under President Obama's Affordable Care Act (ACA), and the aging baby boomer population has also added to this uptick. Additionally, many hospitals, clinics, and other healthcare facilities have adopted electronic recordkeeping systems in recent years. As Americans continue to receive medical care at a higher rate and more institutions maintain software-based records, the demand for health informatics professionals is consistently high. A recent survey by the American Health Information Management Association (AHIMA) noted that AHIMA members with a master's degree enjoyed more favorable job placement rates than their counterparts with lesser credentials. The survey also found that the employment rates for AHIMA members with a PhD or doctoral degree in informatics were not significantly better than those for master's-holding candidates. The table below features unemployment data from the AHIMA survey. The BLS notes that the projected growth rates for jobs related to health informatics are much higher than the estimated rates for all industries. Jobs for medical and health services managers are estimated to rise 17% -- more than 56,000 positions -- between 2014 and 2024. Similarly, technician roles in medical records and health information are projected to grow 15% -- or 29,000 jobs -- during the same timeframe. Master of health informatics salary expectations are significantly higher than the projected earnings of those with bachelor's and/or associate degrees. AHIMA notes that the average AHIMA member with a master's degree earns an annual salary of $86,187; by comparison, bachelor's-holders bring in $66,064 on an annual basis, while associate degree-holders make $49,769 per year. However, annual salaries for informatics professionals will increase incrementally over the course of their careers. Using data from PayScale, the following table features salary expectations for different informatics professionals at four stages of their career. Among the five careers listed on the table above, information security managers earned the highest annual salaries at each benchmark. However, health information managers reported the highest career salary gain with 48% between the entry-level and late-career marks. Depending on their specialization and related work experience, graduates of health informatics programs will be eligible for dozens of positions within the industry. The most common career pathways for master's-holding informatics professionals include the following three roles. EHR Implementation Specialist: Implantation specialists offer technical support during the creation of health management and record systems in a variety of clinical settings. Their tasks include implementing project plans and hardware; configuring and maintaining software to meet service requirements; and acting as liaison between the hospital and vendor staff. While the skills required of a specialist may vary depending on the system being implemented, a solid background in clinical technology and health information management are usually required. Clinical Informatics Coordinator: Coordinators are charged with planning, implementing, and evaluating the information systems used in a particular hospital or healthcare facility. They often manage a network of professionals who work to optimize storage and retrieval of information in order to guarantee that medical personnel have effective access to patient data. They also work to improve upon existing health information systems and therefore must stay on the forefront of related news and innovations. Information Security Manager: Security managers work to ensure that information within a healthcare organization, whether it be an individual patient or the facility's entire business, are kept safe and available in accordance with the organization's security policies and procedures. Knowledge of information security and access procedures as well as federal and state security, privacy, and regulatory law are often required. Making professional connections and learning about different approaches to health informatics is crucial to your success. Professional organizations offer a great entry point for students who want to learn more about their chosen career path. Below you'll find three of the country's most prominent organizations established for health informatics professionals. These organizations host networking events, provide online trainings, maintain active job boards, and offer other services for career-ready college graduates. Resources like these often prove invaluable as you complete your degree requirements and prepare to enter the job market. A national program that connects health informatics professionals and students, AMIA offers individual and professional memberships. The organization holds yearly conferences and provides fellowship opportunities, as well as online courses and webinars covering different topics related to medical informatics. This organization is recognized nationally as the premier hub for professional health information management (HIM) education and training. The AHIMA website features information on certification and career options. An international organization with a branch in North America, HIMSS works to provide training and professional development for members. The HIMSS website features a vast online resource library, links to professional development opportunities and an events calendar. Despite the relative affordability of online master's in health informatics programs, most students still need financial assistance. Students should complete a Free Application for Federal Student Aid (FAFSA) form to learn more about loans, grants, and other opportunities offered through the U.S. government. Additionally, private grants and scholarships are widely available through nonprofit organizations, companies, and other sources. Check out our collection of resources below to learn more about financial aid options.